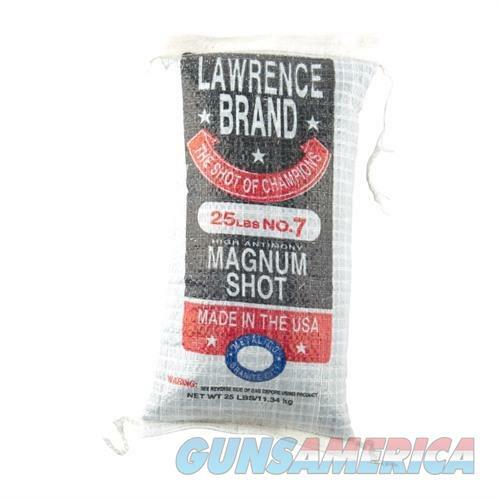 Description: Brownells LAW7M Magnum Lead Shot #7 25lb Bag Building on 100 years of shot-making experience, the folks at Lawrence design their shot to pattern tightly and deliver deep penetration on game. Flows great through shotshell reloaders, too. Magnum Lead Shot is made out of a high-antimony alloy that gives extra hardness and helps prevent pellet deformation at high velocities and pressures. Graphite coating helps pellets to flow smoothly through the loader. Sold by the bag.